FREE AND OPEN-TO-THE-PUBLIC FRIDAY NIGHT LIVE! 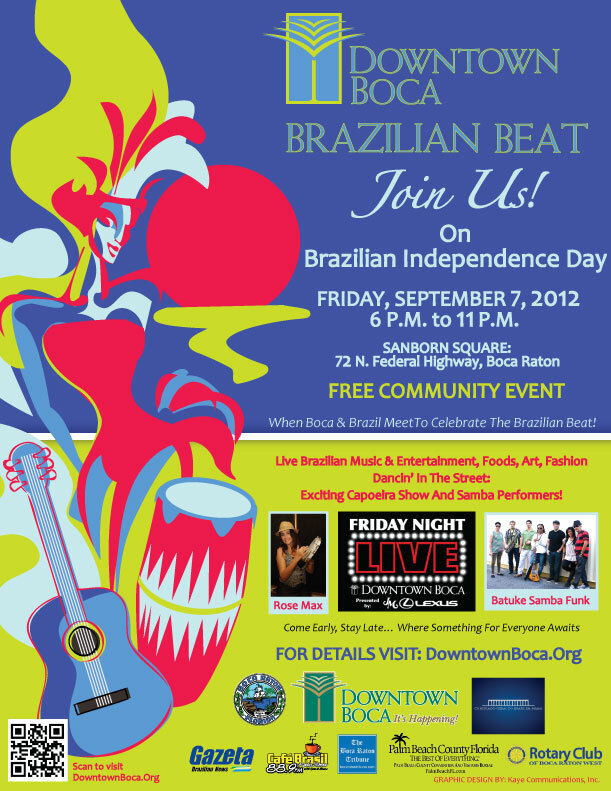 BOCA RATON, FL (July 31, 2012) –Downtown Boca will be this year’s premier hotspot for celebrating Brazilian Independence Day on Friday, September 7th as “Boca and Brazil Meet to Celebrate the Brazilian Beat” as part of the destination’s popular monthly Friday Night LIVE! series presented by JM Lexus. Held at Downtown Boca’s Sanborn Square in partnership with the Consulate General of Brazil in Miami, Café Brasil 88.9 FM, the Palm Beach County Convention & Visitors Bureau, Boca Tribune, Rotary Club of West Boca Raton and others, the free and open-to-the-public festivities will feature award-winning singer Rose Max and fan-favorite Batuke Samba Funk within its jam-packed schedule that includes a Capoeira and Carnival show and Zumba demonstration, DJ Fred, displays of art, vibrant fashion and more alongside delicious Brazilian “grab and go” cuisine served up curbside by the Gourmet Truck Expo. The Friday Night LIVE! activities begin at 6:00 p.m. at Sanborn Square, 72 N. Federal Highway (one block north of Palmetto Park Road) with Gourmet Truck Expo dining, a spirited Zumba demonstration and DJ Fred followed by a procession of Capoeira dancers and Carnival drummers and dancers. Showtime starts at 7:30 p.m. as Batuke Samba Funk, a unique collective of musicians from Brazil and Miami, takes the stage to perform the classic samba/soul sound originating in Rio de Janiero in the late 1960s. The group combines the percussive grooves of Brazilian samba with the funk rhythms of American legends like James Brown and Earth, Wind & Fire. Batuke Samba Funk was founded in 2008 by bassist extraordinaire Diogo Olivera and features a revolving cast of the very finest musicians playing guitars, bass, drums, vocals and Afro-Brazilian percussion. As a signature element of the show, the band will erupt into a samba jam session using traditional Brazilian drums as well as recycled objects such as cans, buckets and scrap metal to create a joyous carnival atmosphere. The night’s entertainment culminates with the performance of “South Florida’s favorite Brazilian singer,” Rose Max and her mesmerizing guitarist Ramatis Moraes. They will be “firing up” the streetside dance floor with authentic, classic samba music inspired by the nightclubs of Rio de Janiero accompanied by a pulsating band and a lively percussion section. Max’s talent and performance has earned her several Miami New Times “Best of” awards as well as three Brazilian International Press Awards. Rolling out the welcome mat to the thousands of event-goers, Downtown Boca ambassadors, including Rotary Club of West Boca volunteers who are fluent in Portuguese, will be stationed throughout the event at the Downtown Boca Welcome Center conveniently located in the heart of the festivities. Participating businesses will extend hours with special sidewalk tastings, samplings, trunk shows, dining specials, menu items and discounts and late night “after parties” at area pubs and clubs will be held for exploring and enjoying the destination, from Mizner Park to Royal Palm Place, including the signature collection of shops and boutiques, restaurants and galleries along Palmetto Park Road and Plaza Real South. Visitors are encouraged to “come early, stay late…where something for everyone awaits” as thousands have done for previous Friday Night LIVE! events that have featured Tito Puente, Jr. and his Latin Jazz ensemble; Chris MacDonald, the “ultimate Elvis tribute artist”; the “CountryTown” Garth Brooks Tribute Show and line dancing; Florida Panthers Patrol Red Zone Night; and City Link’s Boca Beerfest. 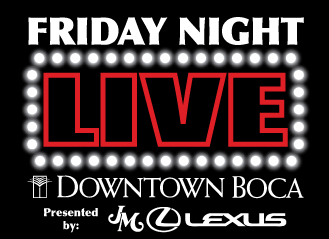 Free parking for Friday Night LIVE! Brazilian Beat is available at City Hall (201 West Palmetto Park Road), the Downtown Library (200 Northwest Boca Raton Boulevard), and other locations downtown where event signage is featured. To extend event-goer celebration through the weekend for more time to explore Downtown Boca and surrounding areas, the shopping/dining/entertainment destination and the Palm Beach County Convention & Visitors Bureau are teaming up with area hotels to offer “soon to be announced” special discounted “Stay & Play” room rates for the “Brazilian Beat” weekend. “We look forward to welcoming thousands from South Florida, some for the first time, to Downtown Boca to enjoy the Brazilian Beat festivities,” said Boca Raton Downtown Manager Ruby Childers. “It will be a great night of celebrating, dancing, dining, and exploring all there is to see and do in Downtown Boca. In working with our programming and media partners, we expect a memorable evening.” She added that the Friday Night LIVE! presented by JM Lexus on October 5, 2012 will have a “Community & Culture” theme and kick off a series of programing related to “American Stories As Told Through The Cultural Arts” with the backdrop of the upcoming presidential debate to the area. For more information and event details, visit DowntownBoca.Orgregularly or call 561-367-7070. To become a Downtown Boca event sponsor, contact Jon Kaye, Kaye Communications at jkaye@kcompr.com or 561-392-5166.